Visit our dedicated courses website at www.cornhillcourses.co.uk for more information! 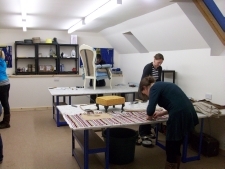 We will be running Upholstery, Soft Furnishing and Canework courses throughout 2015/16. Join us and learn the time honoured skills in a relaxed environment within a converted 18th century Water mill. We are located in beautiful North East Fife surrounded by rolling countryside and a few hundred yards from a nature reserve. 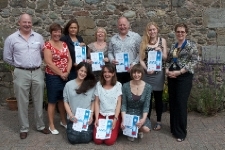 At this years presentations (2014/15) the Accredited Level students showcased their work and received certificates from a representative of ‘The Association of Master Upholsterers’ – the body which designs the course and who send their own assessor to independently mark and grade the students work. We were absolutely delighted that 70% received distinction level and the further 30% were all credit level. That’s all B+ and above!! A fantastic testimony to their hard work and enthusiasm throughout the year. Scotlands first and foremost 'Association of Master Upholsterers Approved Training Centre' with over 30 years teaching experience. 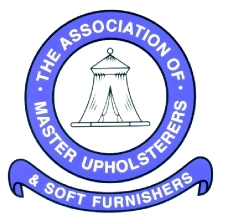 This nationaly recognised DIPLOMA course has been designed by the ‘Association of Master Upholsterers’(AMU), the trade body for upholsterers in the UK. AMU adjudicators mark student exam projects and work. Final marks, grades and certificates are also awarded by them. They also regularly check and oversee the delivery of the courses ensuring students recieve only the highest level of instruction. 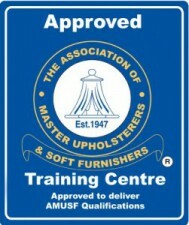 We are an AMU ‘Approved Training Centre’ and teach levels 1, 2 and 3. You need no previous experience to come on the courses. Each level is approx 210 hours. Normally the courses are 1 day per week in 3 x 10 week blocks. Roughly following the academic terms. Students are supplied with all tools and training pieces/frames required. Students will be required to supply some of their own chair frames and finishing fabric covers – materials used in these pieces are charged separate. We can help you sourcing these if required. Working along side other students you will start your practical work on exercise frames that have been devised to consolidate your learning and to give you a clear understanding of the different processes involved without incurring too many unnecessary costs. You will be given sound information on the legal requirements of the UK Fire Regulations, fabrics and their compositions and usage, stuffing heights and profiles. Once you start working on your own individual projects you will benefit from learning by osmosis working along side others that may be working on different styles of chairs. The research projects will also give you a better understanding of the styles, periods and designers of the types of furniture that you may be faced with in the future. These courses are always a small class size to allow a high degree of one to one tuition. Suitable for beginners and advanced students. Perfect for individual projects or learning a specific skill. Students normally bring their own chair/stool but we have some excellent frames for sale if required. On this course we will teach/help you with whatever project you have in mind – however please bear in mind your level of experience when selecting a project. We also run specific classes for those wishing to learn the basics in car or motorbike upholstery. Please contact us to discuss this if your are unsure. A hearty home cooked lunch is included on all the 2 day courses. Perfect for multiple or slightly larger projects. The longer time span allows students to get the chance to try many of the skills required for upholstery. Learn to make cushions, curtains, blinds etc. We now have a dedicated web site for our courses Please visit www.cornhillcourses.co.uk for more information. "Thanks to Steve, Elsie and the girls for a really excellent workshop. Really exceeded my expectations in terms of what we were able to cover in a single day. Very well run, friendly and great to see how the real craftsmen do it"
"I just wanted to thank you for giving me such a lovely couple of days and helping me create such a magnificent stool. Dad is lining up all his chairs for me to ''sort''!! I had a great time and am in awe of your patience with us!" Joan, West Linton.
" Lesley and I would like to thank you for the lovely day yesterday, the individual expert tuition enabled us to complete our items and was a great boost to our confidence. Thanks for the lovely lunch and we enjoyed meeting the family!" Pamela, Broughty Ferry. 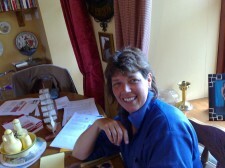 Elsie has been working within the family upholstery business since she was 16 years old. She has been teaching upholstery now for 31 years!! 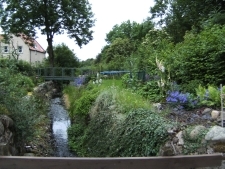 This is a beautiful part of North East Fife with endless walking and cycling within the area where our workshop is situated. We are a stones throw from a lovely nature reserve at "Birnie loch", even close enough for a stroll round at lunch time! Just 10 mintues away is the ''Lomond hills'', twin peaks with fantastic views over the whole of Fife, industrial archeology and an Iron Age hill fort. Lovely villages are close at hand, the ancient burgh of Falkland is 3 miles away, with its lovely square, historic palace, pubs and restaurants. If you are a golfer we need hardly tell you about this area of Scotland! The workshop is 20 mins from St.andrews. There are more golf courses around here than anyone could shake a stick at! Elsie is also a keen player so if your into golf there would be plenty to talk about. Steve is a cyclist and would be delighted to show you some local routes, on or off road, for all abilities. 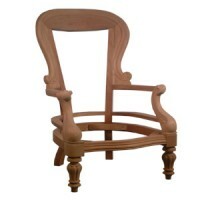 Why not consider one of our Solid Mahogany Frames? Supplied already polished or in the raw state so you can learm some basic polishing techniques. Starting with a frame means you have no stripping and preperation time and can begin to learn the skills of upholstery from the outset. You will be able to upholster a piece properly, which I can assure you will be superior to all shop bought reproductions. As the raw frames are relatively inexpensive you hopefully end up with a finished article which if purchased at retail price would probably cover the cost of your tuition! As well as the satisfaction of being entirely done by your own fair hand in the fabric which suits you. 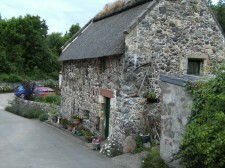 Collessie is a lovely rural hamlet with several lovingly restored thached cottages and buildings. This one is an old wash house, used now as an artists studio. 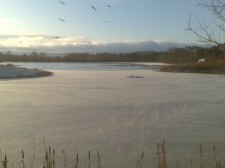 The local nature reserve Birnie Loch is just 4 minutes walk from the workshop! Welcome to ‘Walkers Upholstery’ we are a friendly family business based in Cupar, Fife and have been established for over 50 years. We pride ourselves on our reputation for high quality products and a friendly service. Please take a look around the website.